This is the 2nd set of ATC's I made for Kris. The themes we picked for this set were: Mermaids, Fairies, Circus, and Grunge. Hope she likes them!!! This is my first attempt at making a Zettiology ATC! OMGosh...this ATC was so much fun to make! Zettiology was created by a fabulous artist Teesha Moore. Check out her site......she does amazing work! 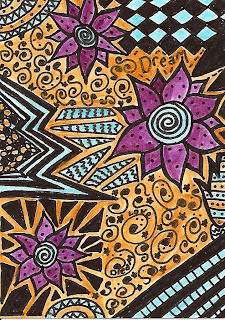 Think Monday - Think ATC challenge for this week was to make a Zentangle. This is an artifical term for scribbling. This was my first attempt at a Zentangle and it was actually pretty fun! I scribbled in black marker than colored in with Twinkling H2o. Thanks for looking! This weeks challenge at Wednesday Stamper , they gave us 2 photos to choose from to altered in anyway we like! This is the ATC I made for this challenge. Thanks for looking and hope you like it! 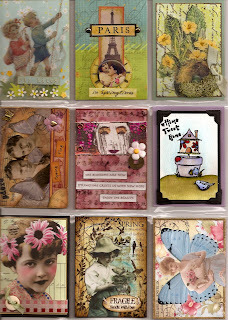 I am doing a private ATC swap with Kris from Nostalgic Collage. We are trading 4 cards and we both picked 2 themes to do. My themes were: Fish & Cowboys and her themes are: Royalty and Birds. I didn't put the bird ATC up there, because it is one that I have already made and posted on my blog! Thanks for looking and if YOU would like to do a private swap with me....please contact me! I was so excited to find out that I was given the Arte Y Pico award by an amazing artist herself, Heather Robinson from Creative Solace (You MUST check out her beautiful work)...Thank you so much Heather...I am truly honored and grateful!!! There are 5 rules attached to this and they are :-1. You have to pick 5 blogs that you consider deserve this award for their creativity, design, interesting material, and that also contribute to the blogging community, no matter what language.2. Each award has to have the name of the author and also a link to his/her blog to be visited by everyone.3. Each award winner has to show the award and put the name and link to the blog that has given her/him the award itself.4. 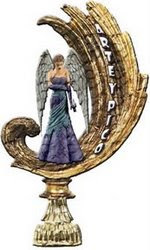 The Award winner and the one who has given the prize have to show the link of "Arte Y Pico" blog, so everyone will know the origin of this award.5. To show these rules. Here are the 6 people who's art work and blog are amazing and inspiring to me! This week has been really fun, because I discovered all the great challenges for each day of the week! I have made it a point to do each challenge!!! You ladies have been so kind to leave me really nice comments....THANK YOU!!! 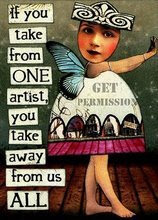 I must say there are SO many wonderful talented artist out there who are very inspiring.....it is so nice to visit all your blogs to see all the beautiful creations you have all come up with! Thanks for sharing your work with everyone!